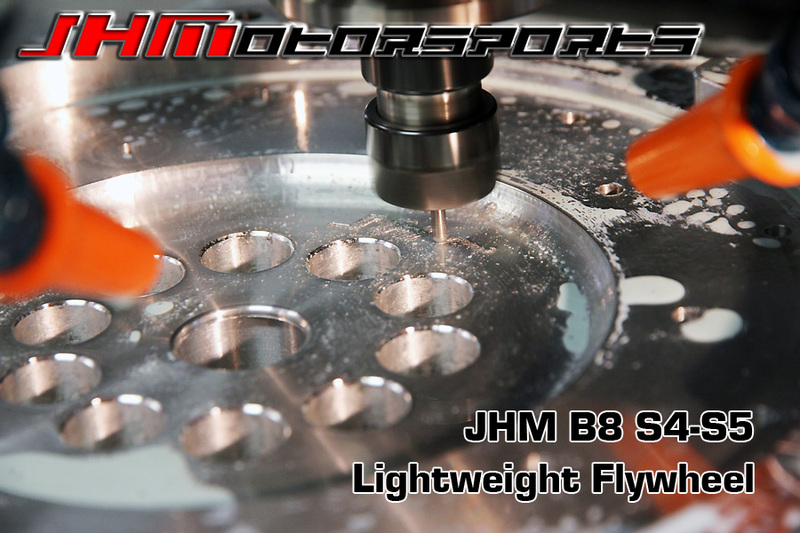 INTRODUCING THE JHM B8 S4-S5 3.0T FSI R-SERIES LIGHTWEIGHT FLYWHEEL AND CLUTCH COMBO!!! 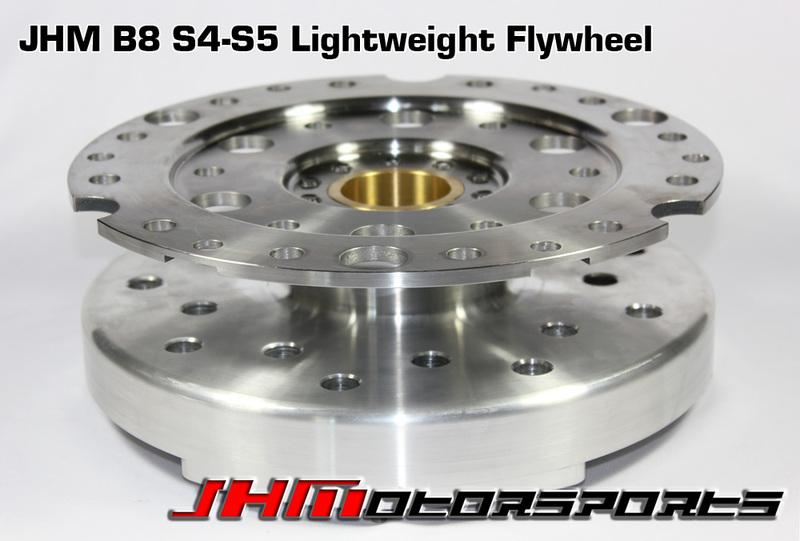 After years of research, development, prototyping, and testing we are finally ready to release our long awaited Lightweight Flywheel and Clutch Combo for the B8 S4-S5 3.0T FSI! We began developing this kit in 2011 and have already installed it on several cars. We like to test all of our products for an extended period of time to verify the durability and longevity of the part before selling it publicly. 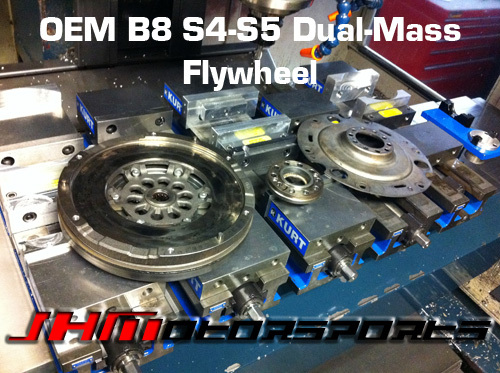 In addition to working with our JHM R-Series Clutch Kit , we have designed our JHM Lightweight Flywheel for the B8 S4-S5 so that it will work with an OEM stock clutch kit or ANY aftermarket clutch kit designed to work with the OEM B8 S4-S5 Flywheel. WHY THE JHM R-SERIES CLUTCH KIT? Since 2010, we have been working on developing a proprietary performance clutch kit for the B6-B7 S4 and RS4. 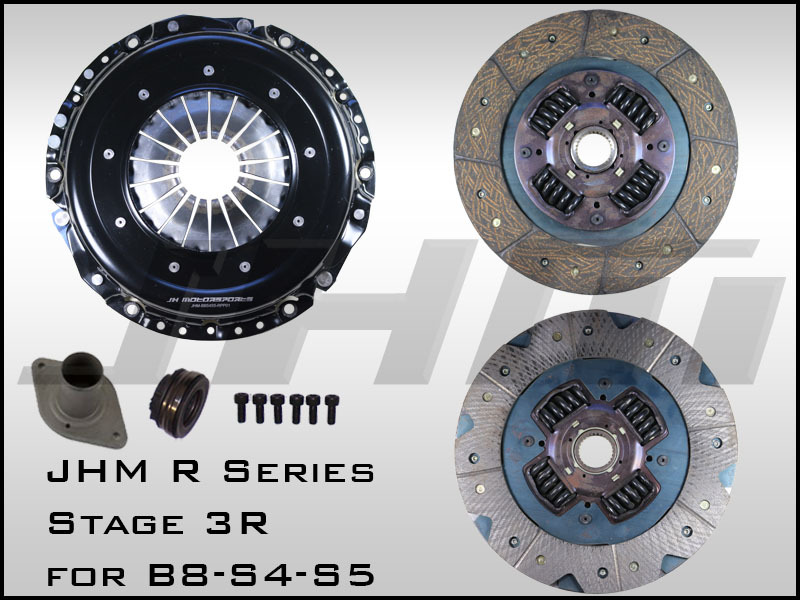 After years of research, prototyping, and in-car abuse we were able to release the JHM R Series Clutch Kits for the B6-B7 S4 and RS4 with excellent results. After the huge success of these clutch kits on our instant torque producing V8s, we decided that we had to get this clutch kit on the B8 S4-S5. 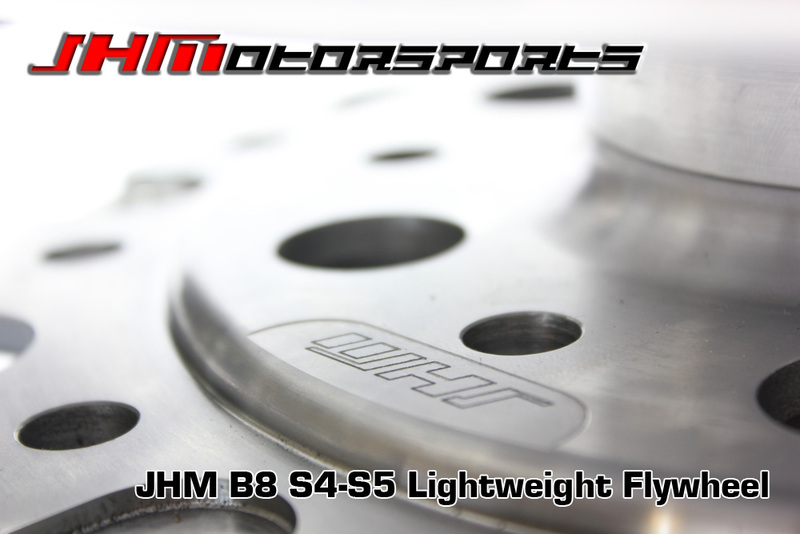 Our years of research and development of this clutch kit have led to the creation of our JHM R Series Pressure Plate. This pressure plate is a non-SAC (self-adjusting clutch) style pressure plate. This allows to run a set of more aggressive discs to hold more power and withstand even more abuse. For example, the shock that our proprietary ceramic 6-puck disc would put on the OEM pressure plate would destroy the SAC. The diaphragm on our R Series Pressure plate is a custom design that we worked for years on to get just right. We designed it specifically for these cars and their throw-out bearings. We did not simply take another pressure plate that works in another brand car and try to make a "band-aid" solution with spacers or other shortcuts to make the pressure plate work for an Audi. JHM R Series Clutch Kit (Clutch Disc and Pressure Plate): Our R Series Clutch Kits feature your choice of 3 different clutch disc materials: Stage 1 R is a performance organic disc and Stage 5 R is a 6-puck disc featuring our proprietary ceramic material. You can chose your clutch disc material from the drop down menu below. We recommend our Stage 1 R Performance Organic Clutch Disc to those looking to get the best compromise between daily driveability and torque holding capacity. Our Stage 3 R disc offers the ultimate combination of daily driveability, torque holding capacity, and durability for back to back to back pulls. 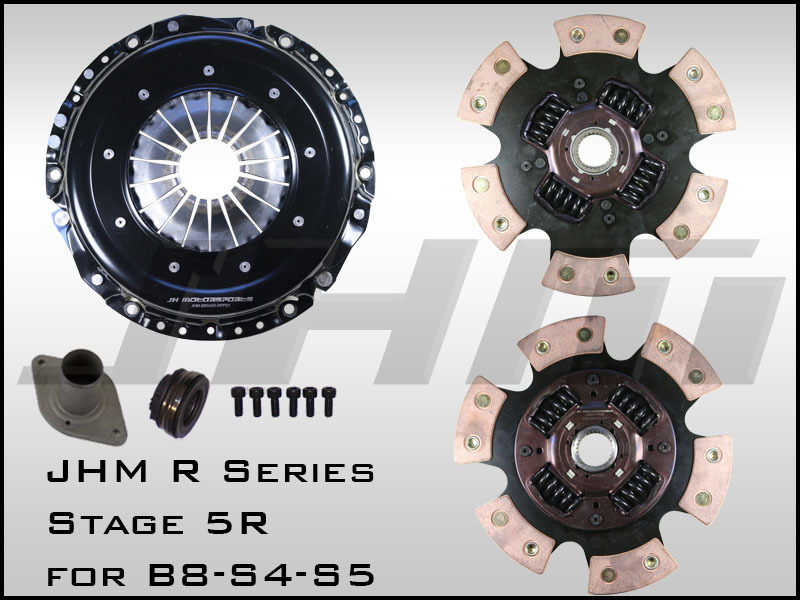 Our Stage 5 R Clutch Disc is the ULTIMATE clutch disc for your B8 S5. The Stage 5 R is a 6-puck clutch disc featuring our proprietary performance ceramic material making it the most aggressive clutch solution that we offer to date. 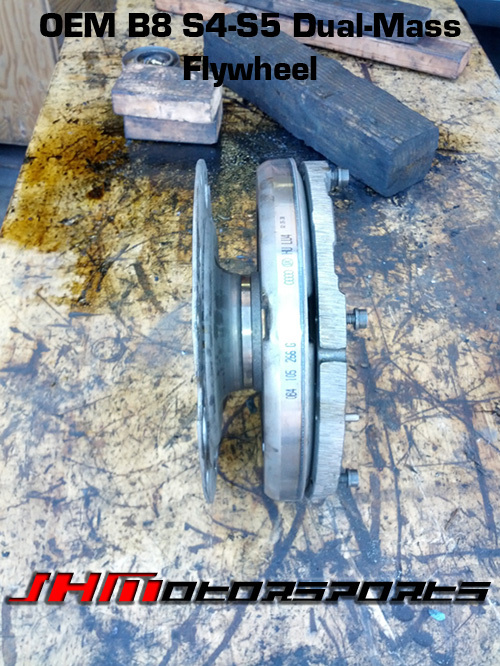 This is clutch disc that we are currently running in our in-house B8-S5. Anyone planning on doing more than the occasional track day should consider the 5R. 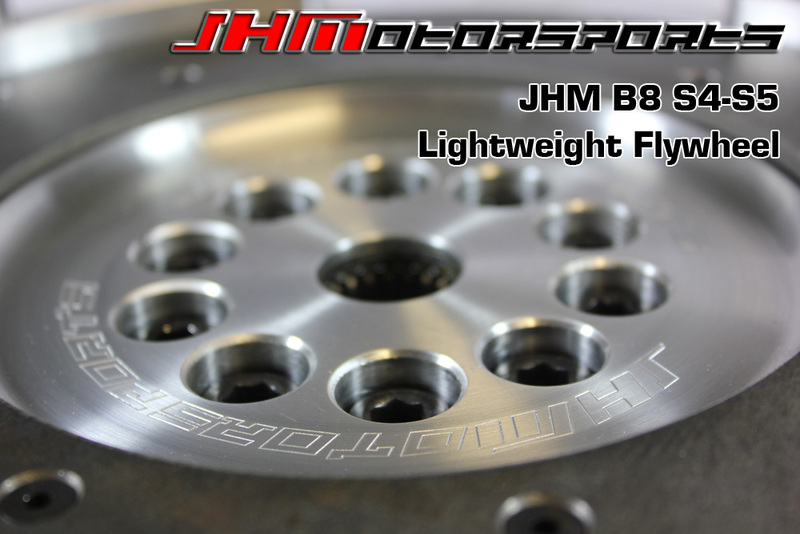 FLYWHEEL SPECIFICATIONS: At JHM, we have weighed over a dozen OEM flywheels. 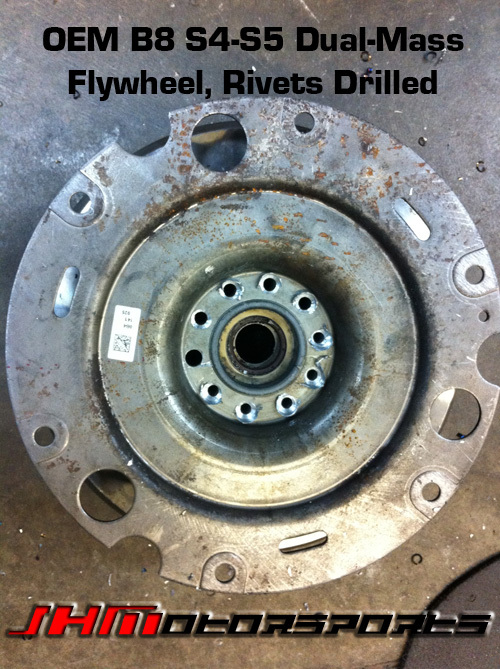 We have seen a wide range of weight variances even on flywheels with the same part number! 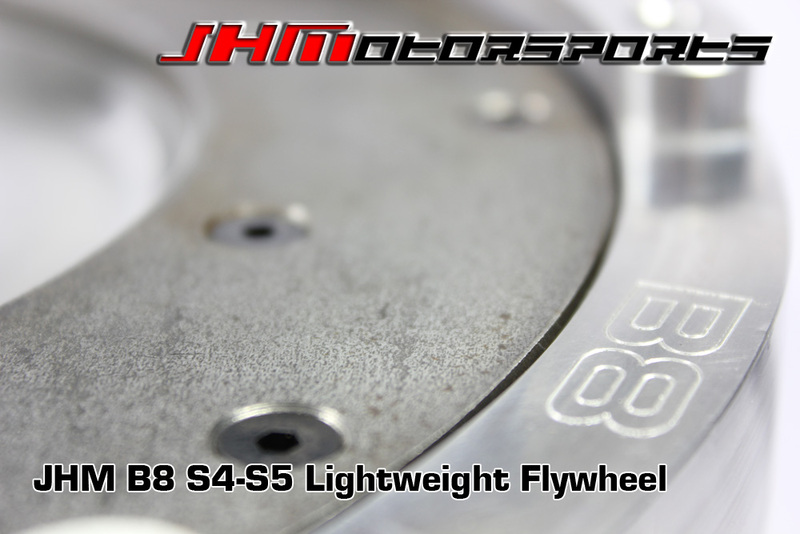 On average, the JHM Lightweight Flywheel weighs 8 to 10 lbs less compared to the OEM B8 S4-S5 3.0T FSI Flywheel. - 43% increase in clamp load torque holding capacity over the already stout JHM Performance SAC Pressure Plate. - The stiffness of the clutch pedal is increased by about 25%. 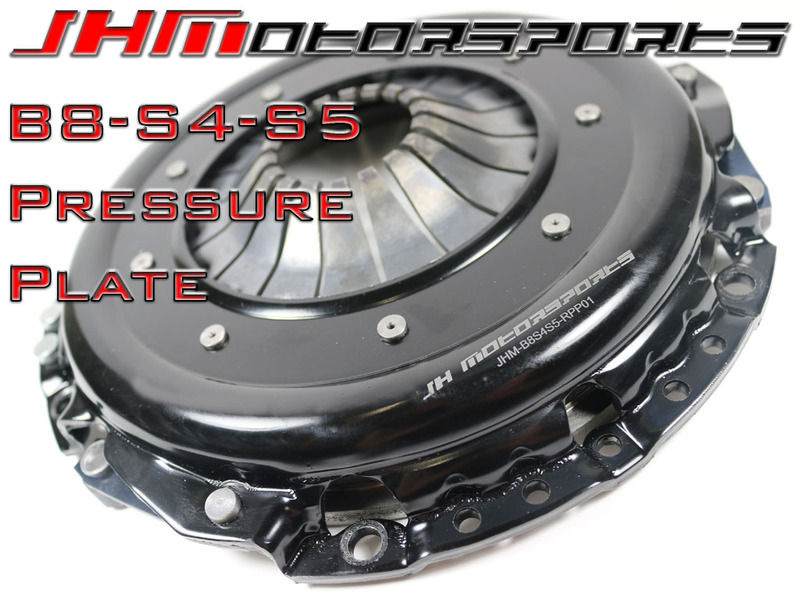 - The spring pressure is much more linear than the B8 S4-S5 pressure plate making the clutch pedal behavior more predictable in the uptake of the pedal and engagement point of the clutch disc. 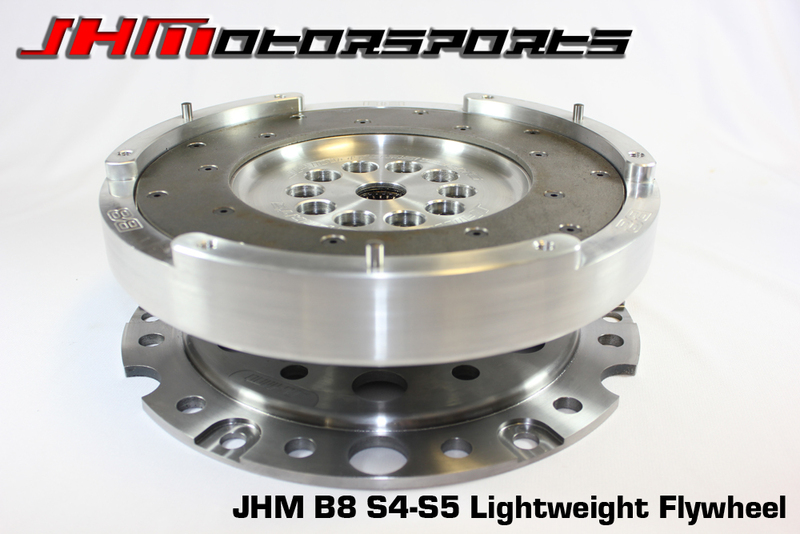 - The JHM R Series Pressure Plate has been designed to work with our JHM Lightweight Flywheel so any B8 customer with our current clutch and flywheel kit will be able to upgrade to the R Series by just purchasing this product. 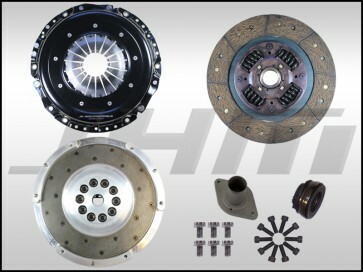 - Aligning the clutch disc, pressure plate, flywheel assembly: Install the throwout bearing/sleeve onto the transmission. For alignment of the clutch disc it is easiest to put the flywheel face-up, place and align the disc splines on center with the center bearing in the flywheel, put the pressure plate on top, visually check that the disc is still on center, and begin to tighten and torque the pressure plate. The pressure plate bolts need to be secured with red, high-strength Loctite. Make sure the pressure plate bolts are tightened in a star pattern at multiple torque intervals. This is to make sure that the pressure plate diaphragm or fingers are not distorted upon installation. Once the pressure plate is fully torqued to the flywheel with red Loctite to factory specifications (33ft-lbs, in intervals), the clutch, pressure plate, and flywheel combination can now be slid onto the transmission as you would a torque converter on an Automatic Transmission. If the assembly will not slip on the transmission, this is most likely due to the fact that the disc is not on center. Remove the pressure plate and attempt to re-align the disc. **NOTE: We've successfully aligned the assembly by following the above procedure. It is not that difficult to "eyeball" the alignment. BREAK IN PROCEDURE: Clutch break-in is important and must be done properly. Clutch break in is important and must be done properly. All R Series Clutch Discs have a break in period of 500 miles. This means that you need to drive as much city type driving as you can for the first 500 miles after the disc is installed. Each time you start from a stop or shift, it aids in break in of the clutch material. Highway mileage does not count. You MUST avoid any racing activities, launching, or aggressive driving that gets the clutch hot during this period.